This book is a song of grace, whispering softly to anyone who is listening for the call of inner peace. For many, the call is so quiet it is perceived as a vague yearning for something more in life. 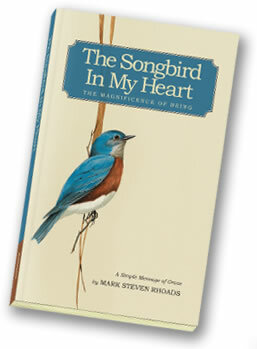 This is the call of the songbird in your heart. It may include the unanswered questions of "Who am I?" and "Why am I here?" For others it may be a simpler question as in "Is that all there is?" We hope and pray the answers are out there, if we only knew where to look. "This book has simple intentions; to point you toward the purpose of your life, to recognize the simple magnificence that is you and to perceive life's remarkable beauty around you. The story is told with prose and poetry that comes from my heart to yours. It is intended to be read on a lazy, contemplative afternoon." The story is told within the simple, beautiful context of everyday grace. While no religious and spiritual traditions are promoted, they are all encouraged and respected. It is the author's sincere hope that you accept his challenge to take charge of your spirituality and find your true nature. In the Name of All that is True." The book is in two parts: the first named "The Magnificence of Being, A Simple Message of Grace" written in the prose and poetry of a journey of self-discovery. The second is titled "Acts of Contemplation, Freedom for a Glad Heart" a series of exercises designed to demonstrate the principles of Part I through your own effort. There are also full color photographs designed to enhance the reading experience. Two chapters are available for free downloading. The first is Chapter Six - "A Moment in Time". This is an exploration of time's magical mystery. The other is Chapter Fifteen — "Nature's Beautiful Face", which witnesses the beauty of outdoor life, its many connections and lessons for us. The finished book is now available from this website and Amazon.com.